For Laurel Tindall, the gymnastics gym has always been home, and since 1973, that home has been the gym at Seattle Pacific University (SPU, 3307 Third Ave W.). Tindall grew up in Magnolia, starting gymnastics at the local recreation center. She attended Catharine Blaine for junior high and Queen Anne High School. During the early years, she started training in the area’s premier program at the Seattle YMCA, under coach George Lewis. Eventually, Lewis was recruited to bring the club to SPU, where he started a college team. Tindall was training with Lewis and competing for the University of Washington (UW) at the time. Eventually, she transferred to SPU and competed for two years there. While Tindall competed in all events, vaulting was her strongest, with two national championship titles under her belt — one at UW and one at SPU. 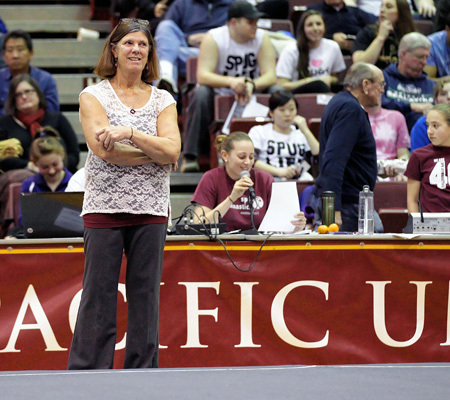 Tindall was “athlete one year and coaching the next” when she was hired to lead SPU’s program. Coaching her former teammates was fun, but the team was small, as was the pay. She worked three jobs to make ends meet. Since 1975, the program has grown from three athletes to about 20, and every year, it’s turned kids away. SPU recruits its gymnasts from across the county and brings them in on official visits; it also has some walk-on athletes. There’s still a stigma against Division 2 schools, Tindall said, but they often explain that they only recruit from the highest level of competitors and often look for kids at private clubs who are marketing themselves. “They have to compete at a pretty high level to get on our team,” she said. Tindall wears many different hats running SPU’s college program and its community gymnastics program, and she’s often working both jobs in one day. She typically spends her mornings at home, doing paperwork. Then, she goes to the gym to start working with college athletes around noon. Most of the athletes come for their general workout from 2 to 5:30 p.m. They also attend morning conditioning three times each week — that program is run by the assistant coaches. Then at 5:30 p.m., “it’s the swinging door, and the college kids leave and the club kids come in,” she said. The club programs run classes until 8 p.m. every night. The club program has 200 kids, 53 of whom compete on its team. Many of the college athletes coach the club students. At the end of the week, Tindall travels with SPU’s team to meets, then returns for club competitions on the weekend. She also judges gymnastics. Tindall recently stopped coaching the club team at its meets every weekend, but she still attends when she can. The college athletes begin practicing the week before school starts. Their season starts Jan. 9 this academic year, and they compete until Nationals in April. To help her manage, Tindall has two assistant coaches. Assistant coach Sarah Marshall started as one of Tindall’s athletes. She graduated in 2007 and returned to coach the team in 2010. Tindall’s coaching style focuses on helping kids realize their potential. She doesn’t like to yell at the kids but stays positive and calm. “My style is to get them to believe in themselves and pull that potential out of them,” she said. With the athletes, “you’re definitely trying to develop mentor relationships with them and...help them be not only better in the gym but better people when they come out of SPU,” Tindall said. This academic push paid off last year, with the team’s highest GPA ever. The closeness of the team carries on throughout life, Marshall said. That team strength was tested even more last year when a shooter came on to SPU’s campus, right by the gym. The shooting “rocked our world a bit,” Marshall said. Marshall and Tindall were in the gym, training with nine of their college athletes. The other coach was in the building where the shooting happened. When the police entered to use the building as a place to interview witnesses, the athletes helped set up. For Tindall, the experience was surreal. It was something “that you never expect to happen at a place like SPU,” she said. Tindall said she was touched by the outpouring of support from the greater community and from their gymnastics community, too. Tindall is no stranger to success, with SPU earning first at Nationals in 1986, 1992 and 1997; last year, SPU ranked third. One athlete, Maria Hundley won three Nationals events, and Tindall’s daughter, Kai, won four. “This last season was a pretty special season for me because it was my daughter’s last season and her winning at the National Championships was amazing,” Tindall said. Tindall never intended to spend nearly 40 years at SPU, but she’s never felt inclined to work anywhere else. 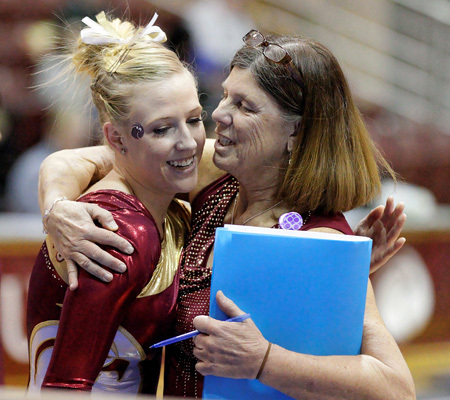 The program is in a good place, she said, and she wanted to coach her daughter through college and build up the program.